Mechanicsville, VA Bojangles'® Tands, INC. Store #104 - Bojangles'® / Tands, Inc.
Tands, Inc-Bojangles’® has opened a new location in Mechanicsville, VA! Located right off of 301 in the Rutland Commons Shopping Center, it offer both convenience and that tasty, satisfying Bojangles’ fair you love. 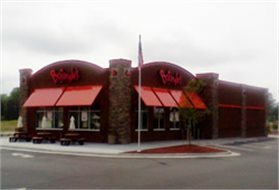 Bojangles’® is quickly becoming a Mechanicsville fast food favorite! From healthy salads to hearty biscuit sandwiches or our famous sides, everyone finds something to love on the Bojangles’® menu. Whether you’re wrapping up some afternoon grocery shopping at the nearby Krogers, or heading out to work early, it’s Bo time! We offer options for breakfast, lunch and dinner — and anytime in between.